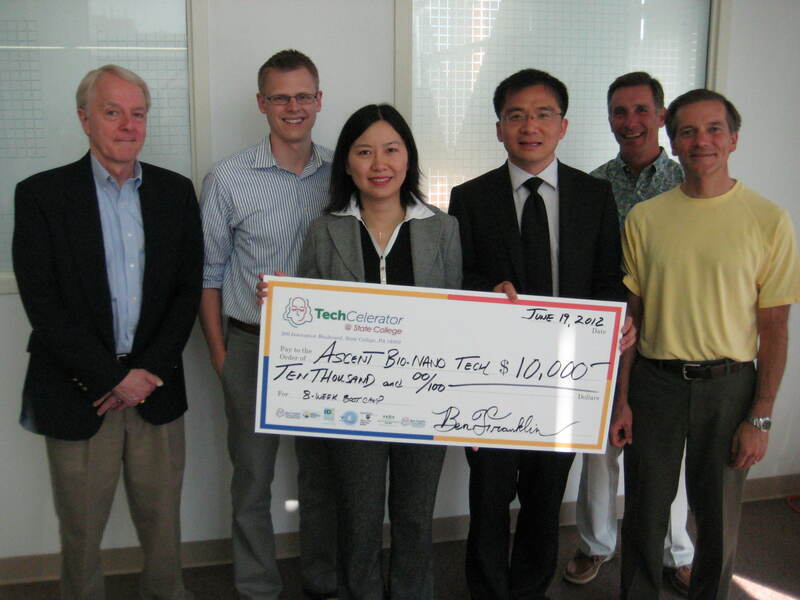 Ben Franklin TechCelerator Announces Winner of $10,000! STATE COLLEGE, Pa.–(BUSINESS WIRE)–Two months ago, the Ben Franklin TechCelerator@State Collegeannounced it was looking for the best and brightest entrepreneurs from Centre, Blair, Mifflin, and Clearfield counties to fill six seats in an Eight-Week Boot Camp Training Program for business startups. least 90 minutes per week on eight successive Tuesdays beginning in April 2012. The response was overwhelming! On June 19, 2012 all six contestants made presentations to a panel of judges comprised of entrepreneurs and CEO’s from successful, local companies including: Dean Bunnell – Indigo Biosciences; Erik Davidson – Buzby Networks; Allan Darr – ProAct Ltd; and Todd Erdley – Videon Central. The winners were Lin Wang, CEO, and Dr. Tony Jun Huang, CTO, of Ascent Bio-Nano Technologies, Inc. (www.AscentBioNano.com). The company, whose technology has been featured in a variety of prominent publications such as Science Daily, Advanced Materials, and the Journal of Physical Chemistry, has developed a chip that can produce three-dimensional focusing of a stream of cells – making it possible for inexpensive portable devices to rapidly screen cells for diseases such as leukemia or HIV. significant interest from two well-known industry leaders regarding possible business collaborations. loan and investment programs, business support and mentoring services, and entrepreneurial training all housed in one location. For more information, go to http://www.techceleratorstatecollege.org.